Chonbuk National University offer the opportunity to university students all over the world to join their International Summer School. All courses in this program are taught in English by renowned educators invited from prominent institutions from abroad and Chonbuk National University. CBNU ISS offers a wide-range of courses including Korean Studies, Humanities, Business & Economics, Media, Communication, Life Science, and Korean Language. You can take maximum 2 courses. Application fees will be waived for all international students. If a student comes with a friend from the same university, registering same number of courses, the two students will be offered a 50 % reduction to their tuition fees. However, the full dormitory fee must still be paid. All these documents must be submitted to Kantor Urusan Internasional (KUI) F13 no later than May 12 2014. 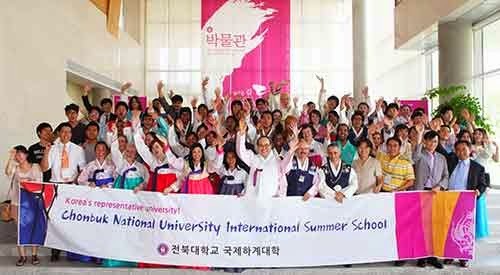 Demikianlah informasi mengenai Chonbuk National University International Summer School, Korea semoga berguna bagi anda.